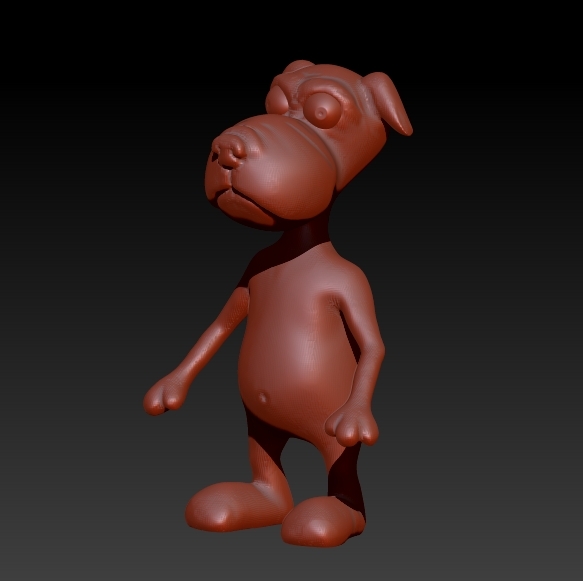 Welcome to part 4 of our ZBrush tutorial on creating a cartoon character. This time we will make use of the Dynamesh feature (auto-retopo geometry) and add some more features like the mouth, the snouth and change proportions of the body, legs and arms. I started correcting the proportions of the characters body and a little bit of shaping with the Move-Brush. I aadded ellbows and knees with the ClayBuildup-brush then. 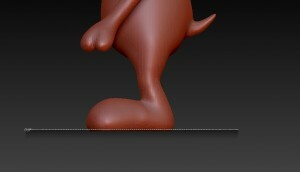 For the feet I used the ClipCurve-brush and I just cut away the lower part of the feet to give them a kind of cartoon style. 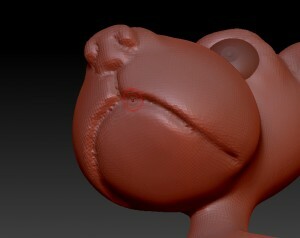 The next step was adding the mouth. I used a mask for the lower part of the head were the mouth would be placed and inverted the mask. Then I made use of the Move-tool to indent this part for the mouth section. The same I did for adding the snout – paint a mask for the snout, invert and move the unselected part out of the head with the Move-tool. Dont’t worry for unclean geometry at this stage of the desigb-process cause Dynamesh can be used to correct it (remember: Ctrl + Left mouse button wipe over the ZBrush-canvas to retopo the model with Dynamesh. And that’s it for this part. In the next tutorial we will increase the resolution of the model and add some finer details before we begin to colorize the character with poypainting. Please subscribe to our youtube channel and follow us on twitter and facebook to be notified when new tutorials will be available.